A current Express Entry draw conducted on Jan 30 noticed the invitations announced in Jan rise to 11,150, presenting this the most significant start to a year in the system of Express Entry five-year history. The least score of Comprehensive Ranking System in the current draw was 438, which is a 05-point reduction above the prior invitation round on Jan 23 and the weakest minimum score for an all-program draw by the Express Entry system of Canada since Oct 4, 2017. The system of Express Entry controls the candidates' pool for Canada’s 03 categories of High Skilled economic immigration Federal Skilled Trades Class, the Federal Skilled Worker Class, and Canadian Experience Class. Applicants who satisfy the eligibility criteria for these categories are accessed into the pool of Express Entry and are provided a ranking score that depends on factors such as their education, age, work experience and knowledge in French or English. The highest-scoring applicants are then announced invitations to apply for Canadian PR by normal invitation rounds, which are typically conducted every two weeks. I.R.C.C implemented its tie-break rule in the draw conducted on Jan 30. The time stamp utilized was Apr 26, 2018, at 05:00:46 UTC. It means that all applicants with a score of CRS over 438, as well as those applicants with scores of 438, who accessed their profile in the pool of Express Entry prior to the selected time and date, got an Invitation to Appeal in this invitation round. 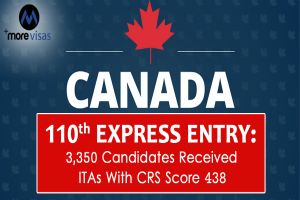 The 3,350 ITAs announced in the latest draw brings this month’s ITA sum to 11,150 — the maximum invitations announced in the Jan since the Express Entry system’s launch in the year 2015. This fast start indicates Canada’s leading admissions targets for the year 2019 and 2020 for applicants in its 03 categories of Federal High Skilled economic immigration, most of whom have their appeals for the status of permanent resident processed by the system of Express Entry. For Achieving Canada's Immigration goals for the year 2019 & 2020, it is assumed that I.R.C.C will have to announce more ITAs throughout this year than it did in the year 2018 — a year that noticed I.R.C.C set a modern ITA record.